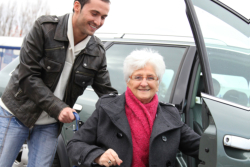 We can bring our clients to and from the hospital. For individuals with health conditions who require non-urgent transport to the hospital, Advance Transport Services offers a reliable solution. We can bring your loved ones to the hospital to receive treatment without delay. On the way there, their conditions will be monitored by our staff. ATS makes sure that your loved ones are brought to the hospital safely and securely while riding in regularly maintained vehicles. Request a free estimate or book a ride now. For further information about this service, please call us at 916-436-6953.